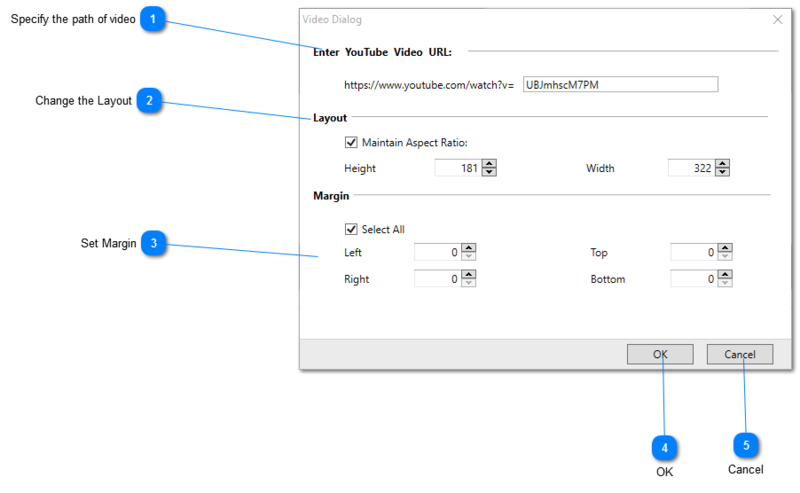 Specify the URL of your YouTube video in this field. You can change the height and width of the video container. By default, “Maintain Aspect ratio” option is checked. Hence, if you change the height then width will also change automatically. If you uncheck then you can set height and width of the video container separately. You can specify the margin of the video from all the sides. The margin will be same from all the sides if “Select All” option is checked. Uncheck this to specify different margin from all the sides. Press “OK” to apply the changes. Press “Cancel” to cancel the changes and close the dialog box.